Moms - grab your family and join us for a Hike + Yoga practice within the beautiful rocky hills of the Ozarks. 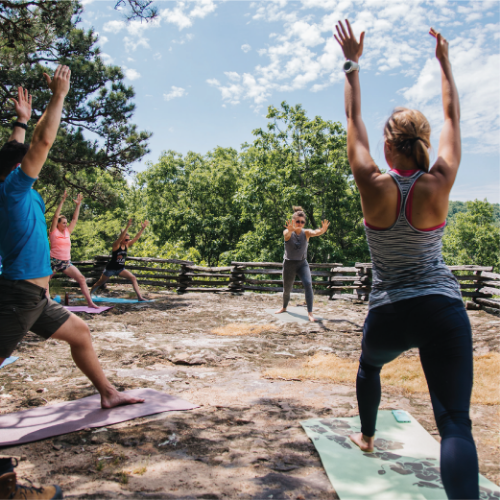 Moms - grab your family and join us for a Hike + Yoga practice within the beautiful rocky hills of the Ozarks. We'll start our day with a 2.5 mile hike with a vertical rise of 350', structured to help unwind and settle into the quiet rhythms of nature. Our hike will lead us up to the mountain with caves and rock features throughout. Once we reach the breathtaking platform vista around sunrise, we'll unroll our mats and move into an hour long yoga practice structured to guide you to a deeper connection with you inner self and with nature. Sam’s Throne is one of the greatest views in all of the Ozarks. Nested just outside of Jasper, AR, it's vista boasts of 360 degree views that overlook the densely forested hills of the Ozarks. This view will for sure include glimpses of the amazing springtime colors of the Ozarks. Gorgeous rock formations and bluff lines are also visible from the vista. The yoga class will be lead by yoga professional, Marisa Frazier. Marisa has been practicing yoga for many years and teaches at studios across the area. After our refreshing day at Sam’s Throne, we will stop in at Sassafras Winery for a tasting and some of their amazing bites to eat. This will be the perfect way to celebrate Mother’s Day with a relaxing day outside. Anyone wanting to celebrate Mother’s Day in a ver unique way! Anyone looking for a relaxing day in nature.